The blood-brain barrier serves the critical role of allowing only certain types of molecules to enter the brain from the blood stream. This important capability protects the brain from exposure to harmful chemical compounds. However, it also prevents certain drugs from entering the brain to treat brain disorders or diseases such as Alzheimer’s disease. Since the segment of the US population older than 65 is expected to increase by 50% by 2030, and the cost of care to treat patients with these kinds of brain diseases is billions of dollars per year, finding new ways to help drugs cross the blood-brain barrier would provide significant benefits to patients and the nation. Nevertheless, understanding how therapeutic drug molecules move or don’t move across the barrier into the brain has remained elusive. The proposed research will combine existing theories in a new way to understand how this movement is controlled across the blood-brain barrier, and will use an extensive computational tool-kit to engineer favorable pathways to transcend it. A new breakthrough technology emerging, based on layer-by-layer assembly of nanoparticles that allows for controlled release of therapeutics in vivo. 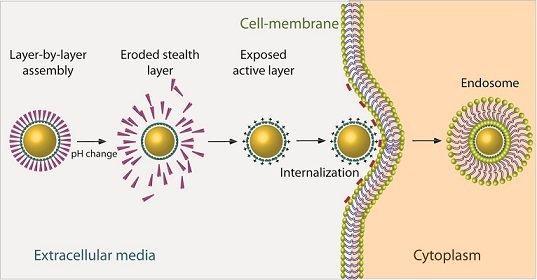 Instead of nanoparticles indiscriminately targeting cells and dumping their entire drug payload into the cell, it is now becoming possible to target specific cells and have a regulated drug dosage through chemical control. The chemical regulation can be achieved from simple physiological controls such as pH, ion strength, or even external stimuli. Nanoparticles offer unique chemical interactions in the translocation process through cell membranes. The overall translocation rate of the nanoparticle can vary immensely based on the charge of the surface functionalization along with shape and size. Using advanced molecular dynamics simulation techniques, we compute translocation rate constants of functionalized cone, cube, rod, rice, pyramid, and sphere-shaped nanoparticles through lipid membranes. Tailoring viruses for future technological advances is a promising field, but the designing the virus-like particles is challenging both from experimental and computational perspective. In this project, a new computational method is implemented (called Multi resolution coarse graining) for designing virus-like particles for use in nanotechnology and nanomedicine. The viral capsid is essentially composed of multiple protein units that self-assemble in a special symmetrical motif, for example icosahedra. The capsid devoid of its genome offers a stable constrained capsule for drug-delivery, while the capsid protein itself can be derivatized for targeting specific sites. Viruses offer infinite possibilities of modifications and their effective use in nanotechnology and nanomedicine is limited by our scientific innovation.